We posted this recipe a couple of years ago, but we make no apologies about repeating it - it is quick and easy to make (Neither Simon nor I would make it onto The Great British Bake-Off!) but more importantly it is indulgent and delicious! No Christmas Holiday in France would be complete without a Galette des Rois! 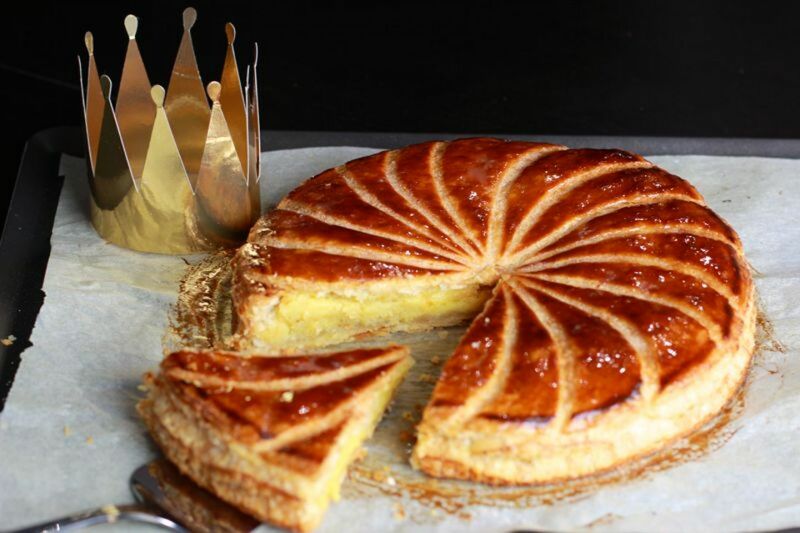 The Galette des Rois is a cake traditionally shared at Epiphany, on 6 January (Twelfth Night). It celebrates the arrival of the Three Wise Men in Bethlehem. The Galette is a puff pastry cake, with a small charm, the fève (literally 'the bean'), hidden inside (much as a lucky sixpence is hidden in a Christmas pudding in Britain). It is filled with frangipane, a cream made from sweet almonds, butter, eggs and sugar. Epiphany corresponds to the moment when the baby Jesus is presented to the Three Wise Men, to give their gifts. Like many Christian festivals, the date of Epiphany corresponds to what was originally a pagan festival. In the past, the Romans celebrated Saturnalia, the festival of the winter solstice, at which a king or queen was chosen for one day, by means of a white or black bean hidden in a cake. We have borrowed a recipe from Raymond Blanc, chef-proprietor of the Manoir au Quatre Saisons near Oxford, which is a fabulous destination if you want to pamper yourself with a weekend of Michelin-starred luxury! You will get two sheets of pastry – 35 / 22.5 cm in a pack, so cut a 20cm circle for the base from one sheet and a 22cm circle for the top out of the other sheet; refrigerate for a minimum of 1hour. Any excess pastry can be kept for other use. Preheat the oven to 180°C. In a large bowl, whisk all the ingredients together and mix to a smooth texture; reserve in the fridge. Spoon the almond cream into the centre of the puff pastry reserved for the base. With a palette knife spread the cream into an even circle leaving a 2cm gap from the edge. Brush the beaten egg yolk mixture around the 2cm gap and carefully drape the top circle of pastry neatly on top, press gently to expel all the air and using your thumb seal the pastry all around the edge. Chill or deep freeze the galette for 1 hour to firm up the pastry and with a sharp knife, trim the edge of the galette to an even circle so that it rises evenly. With the back of a knife crimp the outside edge of the pastry all around . Here you can use your artistic flair. Brush the Galette with beaten egg yolk. With the side of a fork or back of a knife, start from the centre of the Galette and score a spiral right up to the edge of the pastry. Repeat this to achieve an attractive design (if you feel unsure you could just simply criss cross the top of the galette). Cook in the preheated oven at 180°C for 45 minutes. Leave it to rest for 5 minutes before serving. Whoever gets the slice with the charm in it becomes King or Queen for the day - but mind your teeth!